When I first moved to Boise, this was the traffic bridge over the Boise River. It made me cringe every time I had to go over it because it was two-way traffic, and I always thought my car was going to get clipped by a big truck going the other way. 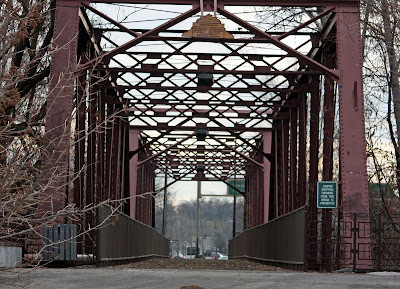 The bridge is now for pedestrians and bicyclists, and is listed on the National Register of Historic Places. I guess that without traffic one can see with more ease the beauty of this imposing bridge. I dont think that would be my favorite bridge either, scary looking. It does look too narrow to be two-way. Glad they changed its use then. I love bridges and this is a good one. Isn't it great when a bridge is converted to pedestrian traffic? I'm assuming another, more roomy bridge now carries the car traffic this once carried.